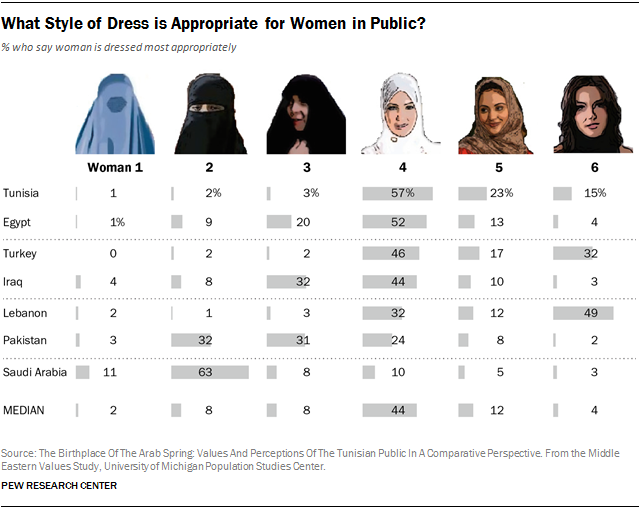 On 8 January 2014, Pew Research Center published a survey that was conducted in seven Muslim-majority countries (Tunisia, Egypt, Iraq, Lebanon, Pakistan, Saudi Arabia and Turkey) on How people in Muslim countries prefer women to dress in public. Two questions were basically asked. The first question addressed by the research center was: What Style of Dress is Appropriate for Women in Public? The survey found that most people prefer that a woman completely cover her hair, but not necessarily her face. Only in Turkey and Lebanon do more than one-in-four think it is appropriate for a woman to not cover her head at all in public. Overall, most respondents say woman #4, whose hair and ears are completely covered by a white hijab, is the most appropriately dressed for public. Note on dress style: Woman 1 = fully-hooded burqa; Woman 2 = niqab; Woman 3 = hijab; Woman 4 = hijab; Woman 5 = relaxed hijab; Woman 6 = no head covering. Second, the research center asked: Should Women Be Able to Choose Their Own Clothing? Only 4% said that it is appropriate for women not to cover their face and hair in public. 52% preferred Woman No. 4; that is the one wearing the hijab, covering her hair and ears but showing her face. This is of course better than the 1% who wanted the fully-hooded burqa; the 9% who wanted the niqab; and the 20% who wanted the stricter hijab (30% in total). It is, however, very worrying that only 4% (compared to 49% in Lebanon, 32% in Turkey and 15% in Tunis) who thought uncovering face and hair in public is appropriate (ignore the socially regressive countries as Saudi, Iraq and Pakistan). This is even more embarrassing to Egypt! 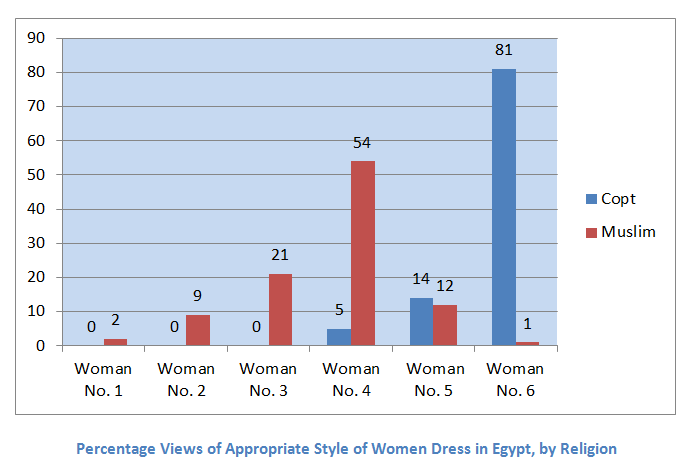 On the subject of whether women should be able to decide for themselves what to wear, Egyptians came last of all nations in their degree of liberality and respect for a woman’s right to choose her clothes: only 14% approved of that, trailing behind Saudi, Iraq and Pakistan! There is nothing that liberal Egyptians can be proud of in that! This important matter of women rights and equality to men, for both questions are proxy to these, is where Copts and Muslims of Egypt evidently, again, differ. There is no doubt that the Copts are liberal while the Muslims are conservative on the issue: Copts do believe, and show in their private and religious life, that women are equal to men in dignity and rights. It’s perplexing that 5% of the surveyed Copts selected Woman No. 5 and 14% woman No. 5. I think this may be possibly influenced by what the Copt thinks of appropriateness of dress style in public to avoid harassment in a Muslim-dominated society. The results of the survey for Egypt are not good – they show how Egypt is regressive in matters of women rights; and, in addition, it shows how Copts are Muslims are very different on this matter. Reblogged this on michaelgerges's Blog. I think it would have been interesting to see the religious differences for the question “Should Women Be Able to Choose Their Own Clothing?” Do you think Copts would have been more liberal on that issue as well? Unfortunately the researchers haven’t published the result of that by religion. But to your question, the answer is: Yes, without any shed of doubt. IF YOU ARE INTERESTED IN THE COPTS, THEIR HISTORY & CULTURE, AND IS INTRIGUED ABOUT THE CONCEPT OF COPTIC NATIONALISM, YOU NEED TO GO NO FURTHER! HERE IS THE PLACE! Enter your email address to subscribe to ON COPTIC NATIONALISM and receive notifications of new posts by email. IS COPTIC THE HARDEST AMONG ALL ALPHABETICAL LANGUAGES AS JØRGEN ZOËGA CLAIMS?